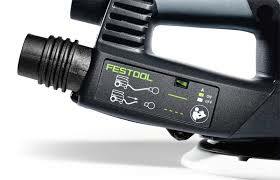 Recently released in Europe Festool’s new sanders the ETS EC 150/5 and ETS 150/3 are sure to be a hit when they reach the Australian market. With the latest in EC brushless motors these sanders have a host of new features to make the onerous task of sanding quicker and easier. Some of the new features are a vibration sensor which automatically adjusts the sander speed when not under load to protect the user from excess vibration, constant speed under load, and a suction detection system which stops the sander if the dust extractor hose comes out, (this feature can be deactivated if you’re using a dust bag). I had the chance to use one of these in 2012 while it was still in R&D. It feels excellent and does a great job of dampening vibration. The low center of gravity allows for perfect flat sanding on edges and softer material. I was impatient and bought the Mirka equivalent since it may be a while for it to come to the states. Hi Chris, we got it into the shop today. I’m a bit concerned that you’re getting swirl marks with the rotex. Give me a call at the shop tomorrow and we’ll see if we can sort it out.